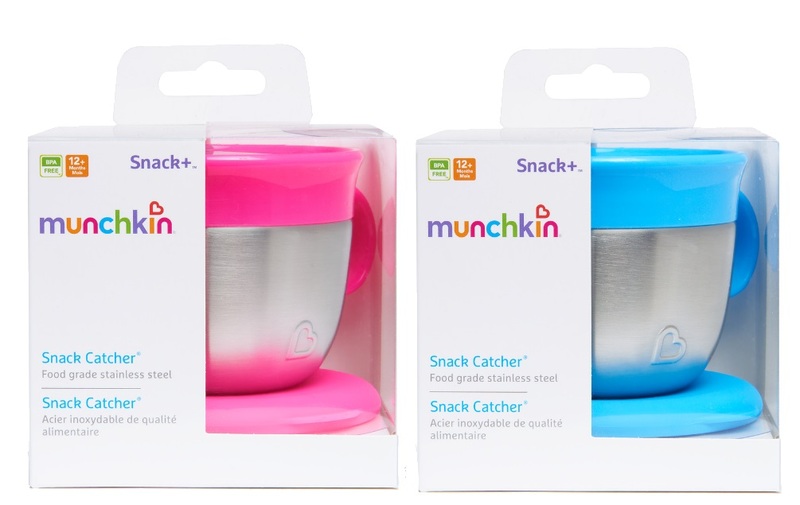 Munchkin's beloved Snack Catcher® got an upgrade with premium materials, flip-top lid and softer silicone flaps. Even though your kids may be tornadoes, your space doesn't need to look like it was hit by one. Sometimes it feels like toddler snacking is a full-time job! Snack+™ Stainless Steel Snack Catcher® is here to "steel" the spotlight when it comes to snack time! 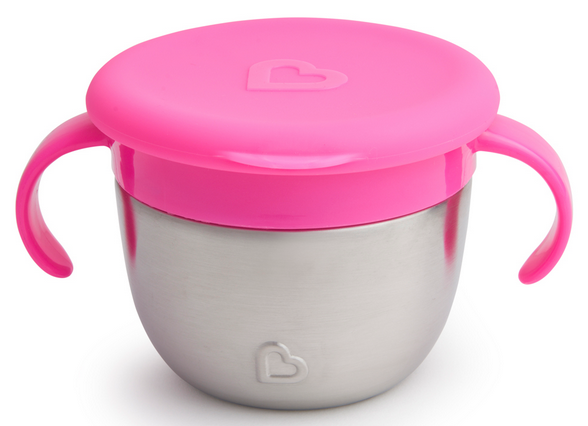 This lightweight and durable stainless steel snack container allows independent toddlers to self-feed with a bit more dexterity and a lot less mess. 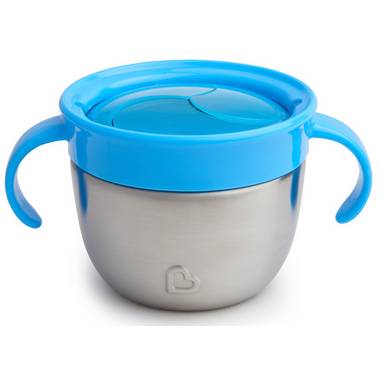 Each Snack+™ cup features a premium stainless steel base and best in class silicone top flaps which are soft on hands and prevent food spills all over the house and car. 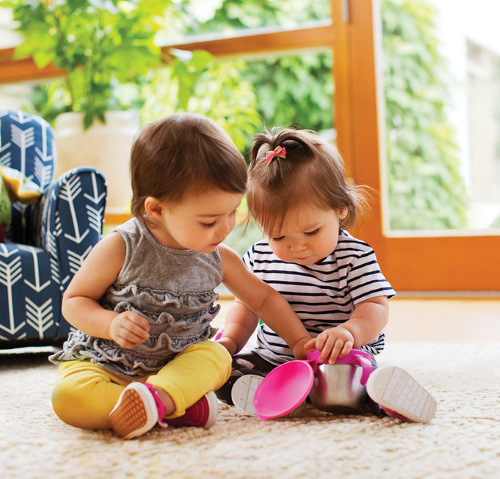 The flip-top lid is airtight and keeps snacks fresh while the handles are designed for even the littlest hands to grasp easily. 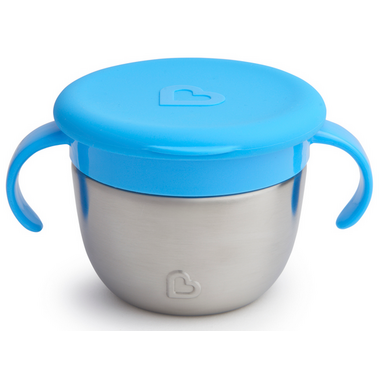 This high-quality snack cup is easy to clean and is a must-have for toddlers on the move. And because snacks come out only when they want them to, snack time no longer means food everywhere except your child's mouth. Win-win for all! Please note: The colour you receive may vary from the image shown. Assorted colours include blue and pink. Great snack container. My baby 10 1/2 months likes to play with the lid and carry it around. I like this container because it's stainless steel but I am surprised at all the 5 star reviews. The lid comes off way to easily in my bag and the snacks fall out quite easily meaning they end up in the bottom of my bag and that it's very easy for my 16 month old to just shake the snacks all over the floor. I don't think it's worth the price. I really like this product. Easy to clean. My 14 month old has no trouble getting snacks out. She likes ripping the lid off and playing with it, but itâ€™s easy to attach it back on. We love this snack container! Easy for my 2 year old to use and it has definitely stopped snacks from ending up all over the floor or from being thrown all over a store. It's very light weight. My daughter seems to enjoy the novelty of the design as well which keeps her interested in the snack.